Nipah virus is suspecting of killing at least 10 people in southwestern India, including a nurse caring for patients, according to officials there. The little-known virus has never been seen in this part of India before and that’s got global health officials worried. It’s one of the deadliest viruses known. Just what is Nipah virus and why is it on the priority disease watchlist of the World Health Organization? It’s one of the deadliest viruses out there. Nipah rarely infects people, but when it does, it can make them very, very sick. “This is a virus that when it gets into people, in Bangladesh, it kills them on average three-quarters of the time and in some cases 100 percent of the time,” Epstein said. It causes encephalitis, a brain inflammation that is often fatal and that can cause long-term disabilities in survivors. Each outbreak is different. 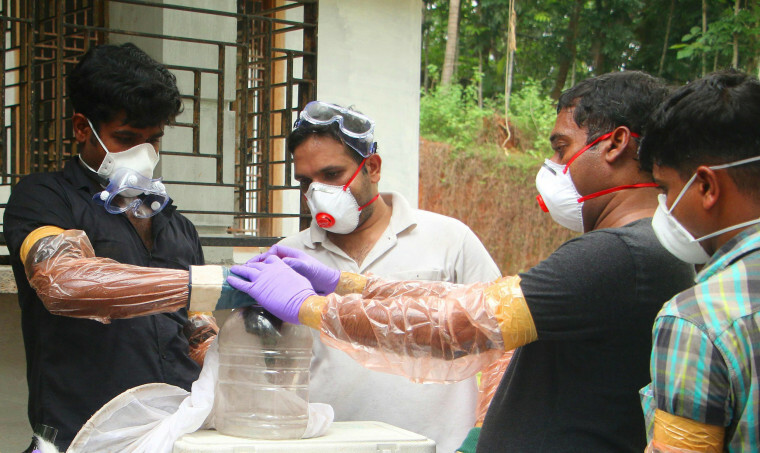 In some of the earlier outbreaks, Nipah virus infection killed 40 percent of people. It can also remain in the body for months and even years, according to the Centers for Disease Control and Prevention. Nipah virus is carried by fruit bats. These bats don’t bite people or even come into contact with people. Instead, the problem comes when people and livestock share fruit with bats. Nipah was first identified in Malaysia in 1999. It’s named after a Malaysian village called Sungai Nipah where pig farmers started developing encephalitis. “The reason Nipah virus emerged in the first place was the pig farming system had gotten so large and industrialized,” Epstein said. Many farmers also grew mango trees near the pig pens. “It was an all-you-can-eat buffet for the bats,” Epstein said. Bats would drop pieces of mango into the pens, and the pigs would grab them. Some bits were infected with Nipah from the bat saliva. Nipah does not make bats sick, but the pigs got a severe respiratory infection that spread as one farmer sold pigs to another. Making a buffer between fruit trees and pig pens stopped the spread in Malaysia. In Malaysia, pig farmers caught the virus from their pigs. In Bangladesh and India, the source is different. There, people harvest date palm sap and sell it as a drink. “It is a bit like sugar cane juice – very sweet,” said Epstein. “People aren’t the only ones who like sweet drinks.” Bats, do, too, and when people slash palm trees to make the sap run out — a little bit like harvesting maple syrup — the bats land on the trees and lick it up. Saliva, urine or feces can all get into the sap that’s collected, and when people drink it unheated, they can get infected. It’s not yet clear what’s happening in Kerala, India. It’s far from the area of West Bangladesh and bordering areas of India where other outbreaks of Nipah have been seen. “There are some media reports of people eating dropped fruit,” Epstein said. Fruit contaminated with bat saliva could in theory transmit it to people. People can also pass the virus to other people, although it doesn’t go from person to person to person the way flu or measles does. It requires fairly close personal contact to spread Nipah, so caregivers can get infected. There is no vaccine to prevent Nipah, although there is a vaccine to protect horses against Hendra, a related virus that causes outbreaks among horses in Australia. It can also infect dogs and people and killed four people in Australia. WHO has asked researchers to work on a Nipah vaccine and treatments. “These are really important animals,” he said. They spread seeds and pollinate flowers. “They are responsible for 50 percent of the world’s rain forest,” Epstein said.